1.1 Our life depends on the kind of thoughts we nurture. If our thoughts are peaceful, calm, meek, and kind, then that is what our life is like. If our attention is turned to the circumstances in which we live, we are drawn into a whirlpool of thoughts and can have neither peace nor tranquility. In Christ the Eternal Tao, there is a work similar to the Tao Te Ching, but it is introduced not as a translation of the ancient Chinese classic, but as a New Testament building on and perfecting the original Tao Te Ching. The Christian understanding of the New Testament is that it fulfills and completes the Old Testament. Where the Old Testament mostly forbids toxic actions and says “Do not murder” and “Do not commit adultery,” the New Testament forbids toxic thoughts and says “Do not hate” and “Do not lust,” offering a greater healing and freedom from evil and pain, even better than freedom from evil actions. And I would like to suggest that The Secret, a book loved by many, can be seen as an Old Testament that reaches its fulfillment and completion in Elder Thaddeus’s Our Thoughts Determine Our Lives. The Secret offers a very attractive promise. On the book’s account, the Secret is a Secret that can unlock youthful health at any age, spectacular and more spectacular wealth, professional success, romance, and more. But there is more one could want, much more. The Secret may offer a program to satisfy one’s conscious desires, but not so much is there a program to transcend one’s desires. Our unrefined desires, our common covetousness, may be for things which will not really satisfy us, especially not as much as some things we may not think to even covet in our present state. And having read and not accepted The Secret and its Law of Attraction which says (along with other New Age sources) that if you think of something your thoughts will become reality, I was blindsided by Elder Thaddeus in Our Thoughts Determine Our Lives, which had, if not a Law of Attraction in full, nonetheless something a lot like the Law of Attraction which said that our thoughts have a great deal more influence than we suspect. It said that if we have nastiness or conflict, it is rarely, or perhaps never, something that happens without our warring with others in our thoughts. Perhaps, as Elder Thaddeus does not specifically suggest, other people have contributed something, and perhaps some people start out with a chip on their shoulders. But they rarely, if ever, start warring against us, and continue their warfare, if we simply do not war against them in our thoughts. Others rarely remain hostile to us if we are gentle, respectful, and never strike back, not even in the most private recesses of our thoughts. And that is a Law of Attraction The Secret barely, if ever, even begins to hint at. It may be implicit, but The Secret never says that if you sow hostile thoughts, you will reap conflict. Our Thoughts Determine Our Lives says more than this. It also talks about thoughts that are in fact neither healthy nor truly our own. The demonic is real and operative, and part of spiritual health is declining an ongoing flood of thoughts that are not to our best interest. And some of the things touted as benefits in The Secret may be less helpful than they seem, even if they are true. It talks about how “…The end of the story about my own weight is that I now maintain my perfect weight of 116 pounds and I can eat whatever I want.” ThePhilokalia, by contrast, see the sin of gluttony as affecting much more than how one looks in a swimsuit: what overeating does to one’s waistline is incidental to what it does to one’s spirit, acting as a gateway drug to more serious sins. I would draw something out of “Be defined and bound by God, not people,” in particular. When someone opposes us and we accept the warring thoughts that come so easily to all of our hands, we are being defined and bound by the people we are resisting, and not, or at least not only, by God. The satyagraha or nonviolent resistance highlighted by Gandhi draws on the Sermon on the Mount and has its power close to the heart of the Sermon on the Mount that simply says, “Do not resist an evil person.” If someone evil to you is hostile and you do not dish out hostility even in the secrets of your heart, that is powerful. If you are only “defined and bound by God, not people,” and turn the other cheek, the roots of hostility begin to melt away. I personally do not know how my life would have been different if I had always shown the perfection of this teaching, but there have been some very rough situations that could have been very different if I had answered each and every hostility with unruffled meekness. We tend to think that changes in our exterior life will make us happy, and this is part of why The Secret is such a runaway bestseller. It promises means to abundant success in various worldly concerns, and never asks the (at times terrifying) question of “What if I get the BMW SUV my heart is dying for now, and it does not deliver lasting satisfaction?” Someone who is a little bit sensitive to memories and experiences may note that sometimes getting some hot luxury item does not give us satisfaction, at least not for terribly long. ButOur Thoughts Determine Our Lives offers a Law of Attraction that recognizes that the transformation that we need, and the transformation that will yield lasting satisfaction, is much more a transformation of our interior lives than anything external. And in regard to the interior life, God wants to give us much better than a cost-of-living raise. He wants to give abundant interior riches, and part of why external circumstances sometimes do not change is that he knows we need something more. Something beyond what The Secret even pretends to offer. It would be true, but deceptive by itself, to say that Elder Thaddeus was a clairvoyant elder who lived to see quite a following. The reason that is deceptive by itself is that that fruit gives an impression that his wishes were fulfilled, when in fact Elder Thaddeus had a much more painful life, with many more wishes not fulfilled, than most of us. The life of a saint is a difficult one with many more obstacles, not less, than your average Joe, and while I don’t want to try to make Elder Thaddeus a saint speaking out of my own authority, his life was at least like that of a great many saints in seeing wish after wish simply denied. His own burden included serious health issues. It also included that his wishes in monasticism to simply be a lay monk, just praying in silence, never really happened. Instead he had, as a monk fulfilling the obedience of serving as an abbot, to take on himself the cross of addressing the great many cares and concerns of supporting the monks entrusted to him. Maybe some of us, in our worse moments, can covet offices and titles. The reality is different, and contains a great many things people coveting honor never imagine in connection with their coveting prestige and some office. If you ask how he was a clairvoyant elder, seeing into people’s hearts and thoughts, the answer is surprisingly simple. Elder Thaddeus had a heart that was pierced again and again until things that the rest of us were oblivious to were enough to pierce his heart. Now it is not particularly hard to make some imaginings and covet a clairvoyant elder’s abilities, but Elder Thaddeus was no fortune teller in the usual sense: when an author came to him and asked a prediction for how well his novels would sell, Elder Thaddeus said, “I am not a psychic!” (Now Elder Thaddeus may have had surprising insights when people came to him in faith seeking a balm for spiritual difficulties, but I insist that the pierced heart he knew was not in any sense what one imagines and fuels if one is coveting clairvoyance.) Holiness is taking up your cross and following in the footsteps of our crucified Lord, and the further you walk on that path, the less your life looks like fulfilling your wishes and desires. This portion of this article is posted by the kind and gracious permission of the other party, to whom I am grateful. I am choosing an example here to try to make my point strongly, as strongly as I see how. If this seems strange, hokey, or putting an unreasonable share of blame on myself, I apologize; you are welcome to skip to the next section. I remember, to pick one of many examples, when a friend who helped me on my journey to Orthodoxy, decided on his own authority that there was something wrong with me and he was going to “fix” me (his term, with his quotes). I caught him in the act and firmly said, “No.” He said I was sending mixed messages. I said, more forcefully, “No.” He reiterated his claim and said that I was sending such mixed messages. I repeatedly said a forceful, “No,” and he kept on telling me I was sending a mixed message, and then, “You can say what you want to say, but I will do what I want to do,” meaning that he would continue trying to “fix” me after I said, “No.” Then I sent a “cease and desist” letter (and he was not so bold as to continue his campaign once the Gmail Abuse Team was in on the conversation). Since then, I’ve briefly reached out, but we have only spoken briefly since. Now I would like to ask what was going on here. A psychologist would speak of boundaries, say that he was possibly doing something wrong at the beginning, and he was definitely wrong to persist after I had expressed a boundary. And I was absolutely right to send a cease-and-desist letter after he repeatedly tried to push past the boundary I was expressing. But I would point out something else. Did he start it? That’s not my concern. Was he in the wrong? Still not my concern, except perhaps as my replies exacerbated the temptations he faced. What really is my concern is that I met him with warring thoughts. And what is more, I spoke to him and answered him out of warring thoughts. Whether or not he had warring thoughts, or his warring thoughts came first, is not my concern. I wanted to have the upper hand as badly as he did, and I got what I really wanted, which was to have a scathing last word. And my warring thoughts (and words) did nothing to defuse the conflict, but only confirmed and agreed to being in conflict, and in fact an intense power struggle. (I had earlier given a cool reception to other attempts to help me out, perhaps part of why he decided that this time around, I wasn’t allowed to say, “No.” I may have been right to say “No,” but I could possibly have done so with more respect.) Some people might say that I was right to send a cease and desist letter, but even if I was right, that only came after I had failed at making the encounter into one appropriate to friends, really failed to even try. And, though I am glad he stopped trying to “fix” me, it is hardly a victory for me that our conversation as friends has not really resumed. I got my way, which is unusual for a situation like this, but I did not truly win. I couldn’t, not with that attitude. Winning might have gently stopped the treatment plan, but it would have saved the friendship, and would have left me at peace instead of with an unhealed painful memory. I believe better was possible, or would have been possible if I had been more grown up. This happened in the Tumane Monastery in 1980. In 1981 I was sent to the Vitovnica Monastery. I was standing underneath the quince tree when I noticed a group of pilgrims that had arrived. She was in the group and she came up to me to receive a blessing. And this is what she said to me, “Oh, Father, I had no idea that people were so good!” I asked her whether she was referring to her colleagues at work and she said she was. “They have changed so much, Father, it’s unbelievable! No one offends me anymore, and I can see the change in myself, as well.” I asked her whether she was at peace with everyone, and she answered that there was one person with whom she could not make peace for a long time. Then, as she read the Gospels, she came to the part where the Lord ´commands us to love our enemies. Then she said to herself, “You are going to love this person whether you want to or not, because this is what the Lord commands us to do.” And now, you see, they are best friends! And I have experienced profound respect from people I have shown profound respect. At times I’ve been caught off guard until I remembered the hand I stretched out. The Orthodox Tradition has a great deal to say about our thoughts, and contrary to modern psychology, demonic influence actually contributes a great deal of thoughts we think of as “ours.” The Secret says that admitting a little thought attracts others: if we think in kindness, it opens the door to more kind thoughts, and if we think in negativity, it opens the door to more negative thoughts. And it is right in this regard. Counselors have said in reference to addiction, “You have more power than you think,” and while we can hardly win involved engagements with destructive thoughts, as fighting them may only give them more power, we can refuse entry when they first come to us as very small temptations. (If a candle is extinguished just after it starts to fall, there will be no house fire to fight.) This watchfulness is not easy; monks take years to learn it. But it is possible. Fr. Thomas’s 55 maxims include, “13. Do not engage intrusive thoughts and feelings. Cut them off at the start.” And this is advice well worth following. Put out the smouldering spark when it is a spark: don’t wait to address the problem until your house is on fire. The Secret surges as it builds to its claim that You are God. It speaks of avatars, here meaning living and successful leaders whose words are highlighted in the book. (Note that this is a slight modification of how Hinduism understands avatars, who are essentially great lights from the past, and include the world’s great teachers as understood in the West.) The core idea of an avatar is God come down in human form, the idea being that God, who is at the core of each of us, is not simply represented by avatars, but becomes them. So how does this relate to Christianity? Orthodoxy may be distinctive here, but Hinduism looks surprisingly familiar here to Orthodox. There was one point in a theology course where the professor, a Roman, talked about a Hindu friend saying that he appreciated the Christian teaching of the incarnation, but asked, why only once? Why not an overflowing stream of incarnations or avatars? And I challenged him (perhaps not very Orthodox or very wise in this matter) and said that there was, on a Christian understanding, not only one. The incarnation is perfected in the Church, and every saint, every faithful Orthodox Christian, is a place where the incarnation unfurls. Now I do not understand saints on the Hindu terms for an avatar; I do not believe that they are, like avatars or the Christ I worship, divine by nature, but something happens to created men that makes that matter less than one might think. St. Maximus the Confessor described five great transcendings of differences, the last being a transcending of the distinction between created and uncreated matter. In other words, when the sanctifying God works such a great miracle that the fact that saints and faithful were created and were not divine from the outset is simply not the issue. God has transcended the chasm between created and uncreated: that all the saints were created is entirely beside the point. Christians who find Hinduism’s idea that God is at the core of each of us strange might wake up a bit. In the first chapter of the Bible, we read, “God created man in his image. In the image of God he created them. Male and female he created them.” A person is by nature connected to God, something by which God’s power operates, someone who breathes the breath of God. The image of God in us represents and embodies the Lord. This might be on slightly different terms from what Hinduism suggests, but the Hindu understanding is not strange and may be less different from Orthodoxy than it looks. Then they also will answer, `Lord, when did we see thee hungry or thirsty or a stranger or naked or sick or in prison, and did not minister to thee?’ Then he will answer them, `Truly, I say to you, as you did it not to one of the least of these, you did it not to me.’ And they will go away into eternal punishment, but the righteous into eternal life. Human nature is so much powered by the divine nature that we cannot rush past a beggar without rushing past God himself. Every kindness shown to even the least of those around us will be remembered at the crack of doom. And of course we all fall short, but giving half a loaf is better than giving no loaf. It may be possible for each to think too much of his own potential glory hereafter; it is hardly possible for him to think too often or too deeply about that of his neighbor. The load, or weight, or burden of my neighbor’s glory should be laid daily on my back, a load so heavy that only humility can carry it, and the backs of the proud will be broken. It is a serious thing to live in a society of possible gods and goddesses, to remember that the most dull and uninteresting person you talk to may one day be a creature which, if you saw it now, you would be strongly tempted to worship, or else a horror and a corruption such as you now meet only, if at all, in a nightmare… There are no ordinary people. You have never talked to a mere mortal… Next to the Blessed Sacrament, your neighbor is the holiest object presented to your senses. We live in rough times, but Elder Thaddeus, who wrote Our Thoughts Determine Our Lives, was someone who had been repeatedly imprisoned by Nazis. He lived in rough circumstances, too, and there is some confusion implied in believing that his words flow naturally out of an unspoiled paradise and do not apply to our world with its rough realities. They do, and they are for here, and now. I have had a lot of difficulty appreciating the here and now. This has not usually been because there is nothing to appreciate, but because I had, and still have, thoughts like the “before” of the young woman’s “before and after” scenario quoted above. I am tempted to want a different setting, and perhaps for unrelated reasons such would be beneficial. But refusing to war against others in thoughts is for here and now, for the people I am actually connected with. Our Thoughts Determine Our Lives talks about a parish priest who kept persisting in asking his bishop to send him to another parish, and the bishop, to restate more boldly, said, “You’re not unhappy because you have the wrong external settings. You’re unhappy because you have the wrong thoughts and internal state.” And the fact that the publication date of The Secret, ©2006, was when middle-class American families with Fords wanted BMW’s, not when large numbers middle-class American families are struggling to keep their houses, does not change the core issues. Elder Thaddeus’s life was still under more difficult circumstances, and we may perhaps connect Elder Thaddeus’s words (not quoted here) about spoiled children not knowing what they want and turning to dark alleys, with our going from unusually good times, historically speaking, to bearing a heavier cross. God is still with us whatever circumstances he puts us in, and his words are for us here and now, not hypothetical inhabitants of a perfect world. In my own story, I have great hope arising from this text. I’ve had some real difficulties and I’ve warred against other people in my thoughts. Part of me wishes I had seen this text when I was twenty, but another part of me is wondering at new vistas that may be open to me if I repent of warring against my neighbor in my thoughts. I’m excited at possibilities in interviewing, job hunting, and employment beyond my current contract. I’m experiencing more zest for life than I have had in a long time. Programming expert Alan Perlis said, “The best book on programming for the layman is Alice in Wonderland, but that’s because it’s the best book on anything for the layman.” And a word of caution is due here. 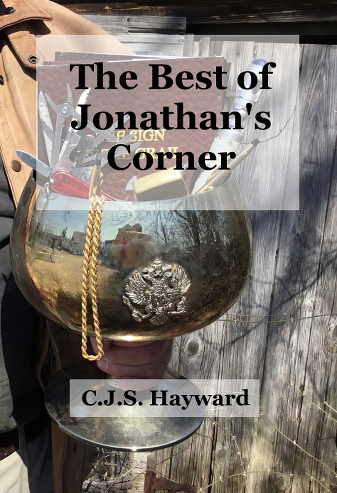 I may have read or at least skimmed through Our Thoughts Determine Our Lives before, but this time I stumbled on it, courtesy of some friends’ generosity and modest praise of the book, as treasure in a field that was completely unexpected to me. However, however much I value it, Elder Thaddeus’s basic claim is only one of many things God may say in drawing people closer to himself. This is only one of the thirty rungs of The Ladder of Divine Ascent (if even that). A great many wonderful classics do not make clear that our hostile thoughts can poison our interactions with others, and praying for others and stopping our warring thoughts can make a world of difference. This is only one flower from a field filled with many flowers. This basic principle as I describe it sounds exotic, and that is a liability I don’t see how to iron out. Its working out is mundane, or perhaps works in the mundane until we can accept the here and now. For me, it is loving the daily grind, in which regard I am fortunate. (I have a remarkably pleasant daily grind as far as external circumstances go.) It is loving God and my neighbor and working through my work and my dealings with others, as all of Orthodoxy is.